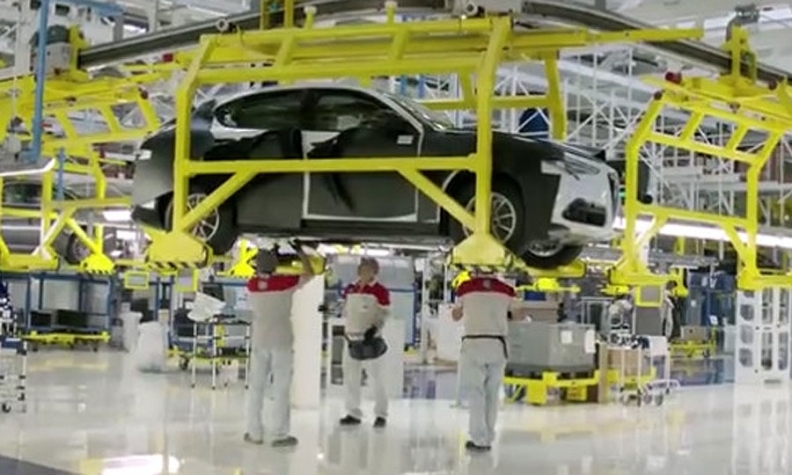 The Stelvio captured in a video at an FCA plant in Italy. Fiat Chrysler Automobiles might have prematurely let the cat out of the bag on the Alfa Romeo Stelvio. In a video posted on FCA’s YouTube channel, which has since been taken down, a Stelvio makes an appearance at the company’s Cassino plant in Italy, where it is being built. The Stelvio captured in the video is partially covered. It is expected to be officially revealed at the Los Angeles Auto Show in November and go on sale in early 2017. In April, spy photographers caught a Stelvio in testing, though it was heavily camouflaged. The midsize, all-wheel-drive crossover shares its platform and engine lineup with Alfa’s Giulia sport sedan. The Stelvio is the second new Alfa Romeo vehicle to result from FCA’s 5 billion euro investment to resurrect the Italian performance brand. It also will give Alfa a foothold in the hot-selling crossover market. The Stelvio is expected to compete with the Audi Q5 and BMW X3.